Click on the map to see a larger version showing where SFWMD will temporarily close public access to the L-67A Levee at the S-151 Structure in Broward County. 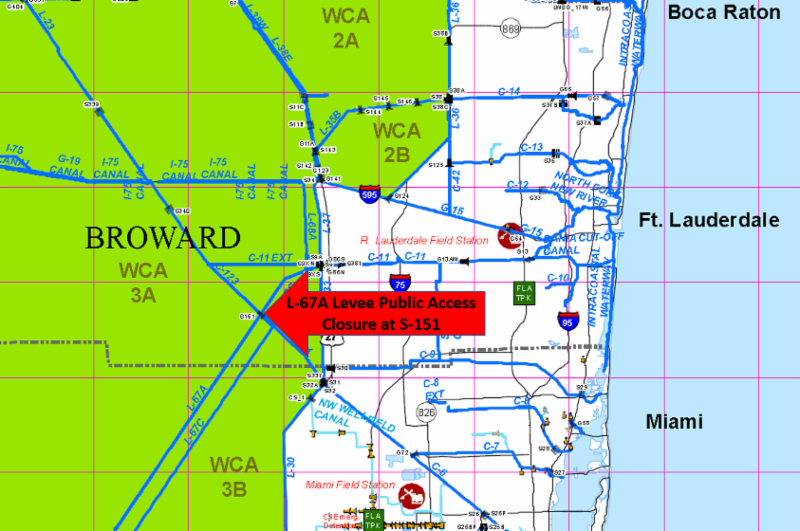 West Palm Beach, FL - The South Florida Water Management District (SFWMD) on June 25 will temporarily close public access to the L-67A Levee over the S-151 Structure in western Broward County. SFWMD will be replacing and automating the S-151 Structure. During this construction, access to the L-67A Levee and access to the northeast and southeast banks of the C-304 Canal at the S-151 Structure will remain closed. The construction work is expected to be completed by May 30, 2019. For more information on recreation closures and to find SFWMD-managed public lands near you, visit www.sfwmd.gov/recreation.